Here are some pages from my color sketchbook, focused on understanding color for the watercolorist. 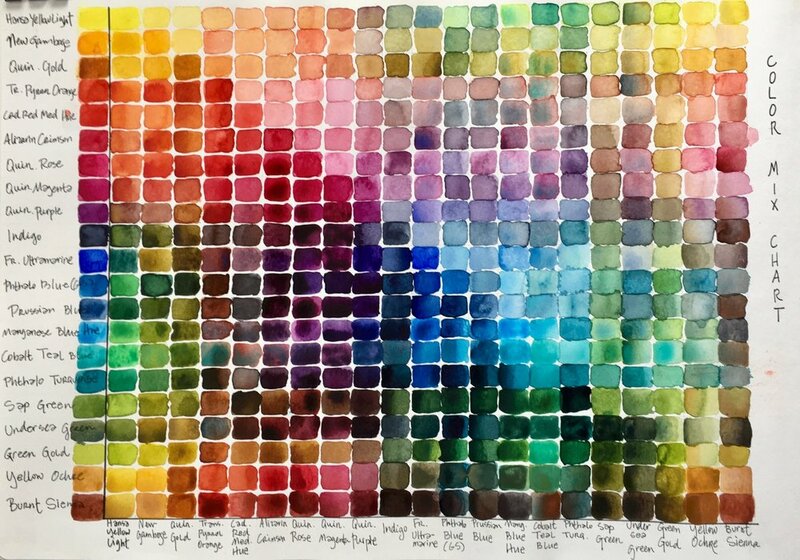 These exercises are designed to explore the properties of watercolor pigments and mixes. I hope these pages might inspire you to explore your own palette. Or maybe these pages will just delight your eyes. That would be great too. I will be teaching Understanding Colors for the Watercolorist as a 10 Week Workshop at Cloud 9 Art School in Bothell on Tuesdays 9:30am - 12:30pm from January 8 to March 12, 2019. Designed to help watercolor artists understand both color theory and paint properties, we will explore the properties of watercolor pigments (transparent, opaque, staining, fugitive, granulating, on my!) and we will look at different ways of mixing color (on the palette, on the paper, wet-into-wet, glazing). We will experiment with color temperature, value, and intensity of pigments. We will learn about the advantages of painting with a limited palette and we will make a lot of color charts in the process. We will play with formulas that work well for specific subjects (skies, skin, shadows). We will explore how to match colors and study classic compatible palettes (colors that work well together in a painting). We will look at the emotions of colors and explore the use of color through art history. Each of the lessons of our workshop will introduce new ideas and exercises, new paints, techniques, and challenge you to think about color in new ways. You will get a creative workout, but in a relaxed, supportive setting, where experimentation and play are encouraged while techniques and observation are emphasized.